The Beatles: the cultural axis for a generation, whose music, style, language, and political impact was seismic, fueled by a hypnotic influence unrivaled in the pantheon of art. The Beatles invented a paradigm and then shifted it, over and over and over again. It is impossible to imagine there being a thing called rock and roll, arguably the most lasting global movement of the twentieth century, without it. Beside the four men who made up The Beatles; John Lennon, Paul McCartney, George Harrison and Ringo Starr, there stand two others most responsible for this; Brain Epstein and George Martin. As manager and mentor, Epstein created the visual revolution that charmed a planet while Martin, as producer and creative Sherpa, did the heaviest lifting of all; he cajoled, conducted, re-imagined and realized the music that shook the very foundation of human spirit. He made songs, glorious songs; perhaps the best and most revered music of the modern age. 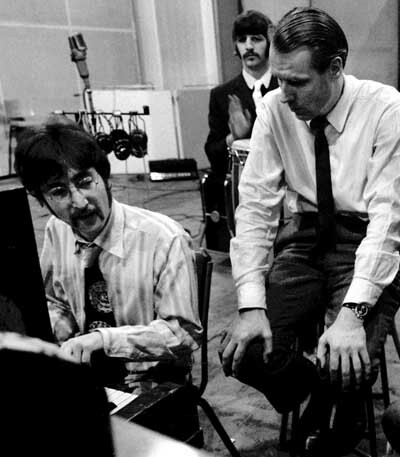 You want to begin to comprehend George Martin’s genius and immense contribution too all this? Simply listen to the music. Do it now. Go ahead. You have heard it a million times, but do it with fresh ears and a pure heart. Deny it is not nostalgic and fresh, bold and endearing, an eruption of joy. I dare you. It is Mozart meets Chuck Berry meets Jackson Pollack meets Abby Hoffman meets vaudeville, theater, sock-hop and cathedral. Then do yourself a huge favor and read Martin’s 1979 memoir, All You Need Is Ears and Here, There and Everywhere by Geoff Emerick, one of his partners in studio magic, and Mark Lewisohn’s brilliant and seminal, The Complete Beatles Recording Sessions. “He is the father of the entire modern recorded music industry. It is his genius and imagination that changed the recording studio from a place for the rigid and faithful reproduction of live performance to an instrument of sublime creativity and endless possibility. He saw in recording the ability to tell stories and create worlds through music and sound using techniques created for radio drama – many by him personally. He extended the “stage" of recorded music past the four walls of the studio out into a whole new universe of sonic imagery. Though it all seems almost commonplace now, this was truly revolutionary stuff in his time. And all of us who tell stories in sound and music owe our craft mostly to him and the Beatles. I have a funny George Martin story. So many of us do. But right now, as I head to the studio in the same way I have for decades, I can only think of him and his wonderful story, and of my profound gratitude for his historical life and work - and for the wonderful life and career that he (and the late, great Jack Richardson) made possible for me. “2016 has brought us the unfortunate passing of such amazing music talent. As a Baby Boomer I guess we can expect more reading that our heroes have died, but the passing of George Martin was a tremendous loss for all of us in the music industry. His contributions have touched millions and many who don't even know how they were indirectly affected by his genius. My direction in life changed the day I heard The Beatles "Love Me Do". It sounded like nothing I had heard before. I was instantly not only a fan of the Beatles but was curious how they created such an amazing sound. I was 12. Moving forward to "Penny Lane" and "Strawberry Fields" was transforming. At 15, I had decided my future; I was going to become a recording engineer and all, because George Martin changed my life forever. I had the opportunity to work with John Lennon in 1974, a memory I will never forget. 42 years later I am still making records, over 400 at this point. I have had a very satisfying journey through life and I owe it all to George Martin. "Calling George Martin the 5th Beatle always felt a little too easy for me. To me, he was the father figure, the moral compass and the sophisticated class that made The Beatles come to life. Without a doubt his musical vernacular and knowledge enabled the group to grow and grow so quickly. Growing up, George Martin's name was spoken in my house with the same reference as the president's. He was that important." Once it seemed complete madness to consider a 74 year-old, Jewish, self-described Democratic Socialist as a serious candidate for president of the United States.